Announcing availability of the all new PWS™ BEV-200 Series Bottle Filler—a compact, portable system without a storage reservoir. Simply drop the output tubing into your own storage vessel and create your own 100% pure bottled drinking water. Designed to be a “bottle filler” the BEV-200 is an extremely portable reverse osmosis + deionization water purification system. Mounted inside a durable plastic toolbox, this water filter will save you hundreds of dollars per year vs. buying bottled water. Industrial chemicals and solvents like TCE, MTBE, VOC's, etc. Our unique multi-phase water filters will outperform every other water purification system on the market. We invite you to test us against any other water filter (even distillers) to see the difference yourself. Now you can have an unlimited supply of pure, fresh, great tasting water for drinking, cooking, coffee, tea, baby formula, crystal clear ice, and for your pets. PWS™ BEV water filters offer you and your family the ultimate in water purity and biocompatibility. The BEV-200 system operates exactly like the BEV-100 with one exception—you fill your own bottles. (The upper half of the BEV-100's cabinet is a 2.2 gallon storage reservoir.) To see just how easy installation and maintenance is for the BEV-100 system, watch the installation video. 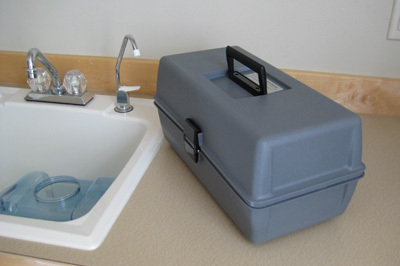 Designed for apartment dwellers, renters, and motor-homes the new PWS™ BEV-200 Series is a portable unit housed in a rugged plastic tool box. The coupler connects easily to almost any faucet. And when you are done filling your storage bottles, the BEV-200 can be closed up and stored away! Off-the-shelf RO membranes used in the majority of reverse osmosis systems simply do not provide the consistency necessary to ensure BEV quality water. Outside of laboratory conditions other membranes seldom meet their stated specifications. Our exceptional reverse osmosis membrane provides for consistently high rejection rates, even in real world conditions. Typical RO systems remove only 60-80% of fluoride, nitrates, and radioactive contaminants. By including our unique deionization module the PWS™ BEV systems remove greater than 99% of these (and any other) toxic contaminants. With a cost of just pennies per gallon, the PWS™ BEV-100 systems pay for themselves very quickly when compared to bottled / delivered water which averages ~79¢/gallon. If you use 2 gallons per day, you'll save over $400 per year! Plus, you'll have confidence you are providing your family the ultimate in pure drinking water regardless of whatever new exotic chemical is found next in our water supplies. The PWS™ BEV-200 Series appliances ship with the necessary hardware to mount our quick connect coupler to any faucet. All components are NSF certified and/or FDA approved materials. 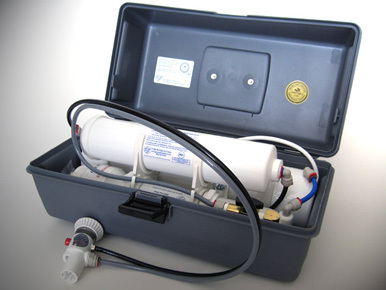 Can be configured with a booster pump for emergency operation. 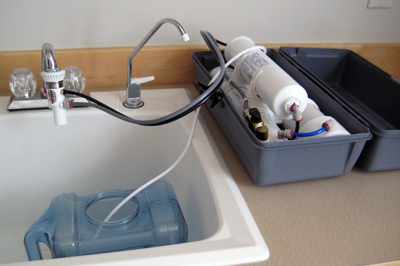 Picture above shows typicall setup of the BEV200... attach coupler to faucet, place your container in the basin, and turn on the cold water. Thats all there is to it. Not the most glamorous water filter, but it isn't designed to be pretty, just effective! This page is under improvement, expect changes. ©1995-2019 Pure Water Systems, Inc. All rights reserved.